As a holiday gift, I’m giving you the recipe for one of my all time favorite things to eat in the winter: Fish Head Soup. I asked my mom to teach me how to make it the other day. Unfortunately, that means some of the measurements are not exact. I did my best to catch things and measure them before my mom threw it in, but sometimes I failed. Use this as a guideline, then taste, and adjust to preference. 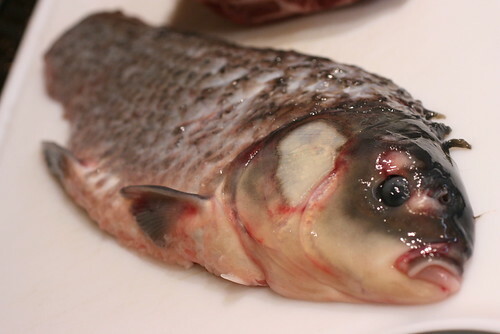 Traditionally, Fish Head Soup is made with a fish head, but they messed up at the supermarket. My mom asked them to cut the fish in half and instead of cutting it in half cross-wise, they cut it length-wise. You can make it either way.